Today there is new demand for more solutions to reduce concrete silica dust on the job site. 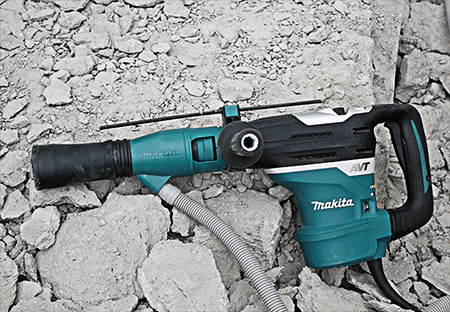 Makita® has an expanding dust extraction system with vacuums, accessories and attachments for use in concrete drilling, breaking, surfacing and cutting applications. 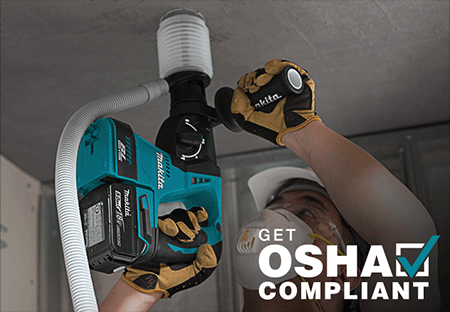 Makita® provides the options you need to build an OSHA compliant system for your job site, even if the job takes you away from a power source. 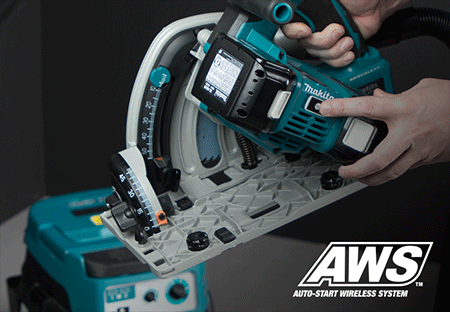 Makita® is the leader in cordless technology, so build a system powered by 18V LXT® batteries and benefit from the expansive breadth-of-line of the world’s largest 18V cordless tool system. 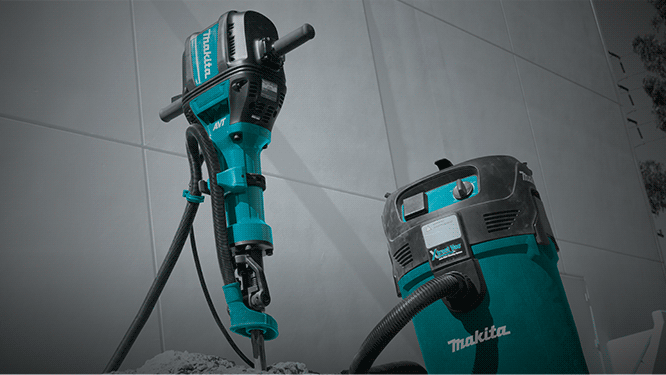 If you are near a power source, plug in with Makita® corded dust extractors that combine top performance metrics with lower noise, less weight, and longer service life. 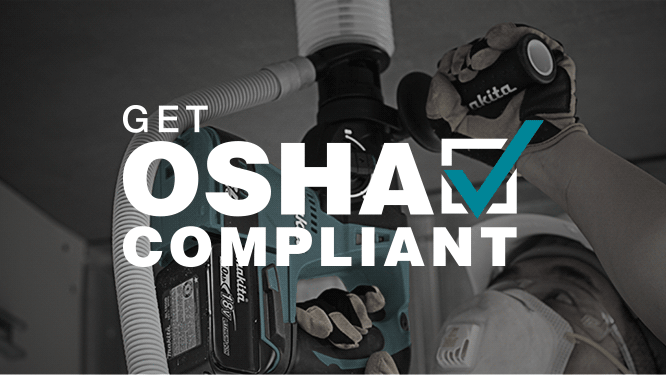 OSHA is amending its existing standards for occupational exposure to respirable crystalline silica. It has determined that employees exposed to respirable crystalline silica at the previous Permissible Exposure Limits face a significant risk of material impairment to their health. New standards took effect earlier in 2017, and construction industry has until September 23, 2017 to get compliant. Learn more about the rule, provisions and how to get compliant. 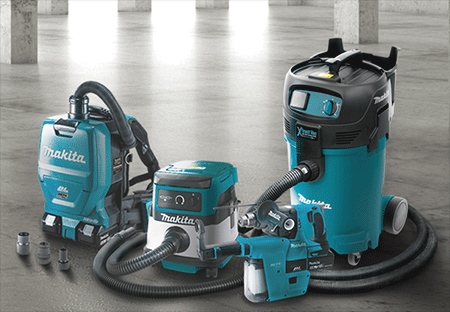 Makita has an expanding system of corded and cordless dust extraction solutions, including fully OSHA silica dust compliant backpack and canister vacuums that are battery operated. The system offers four distinct solutions for contractors. Ultimate Simplicity and Portability. Built-on dust extractor for concrete and drilling. Where increased capacity meets portability. The convenience of cordless. Corded and Cordless Versatility. Designed to deliver compliance in a wide variety of applications. High capacity dust management solution.